Learn more about Giving Hope Lawn Management and all the lawn care and landscaping services we provide. We offer free quotes, make it easy to schedule your service and have a 100% satisfaction guarantee. Giving Hope Lawn Management serves areas from Williamsburg to Richmond and surrounding areas. 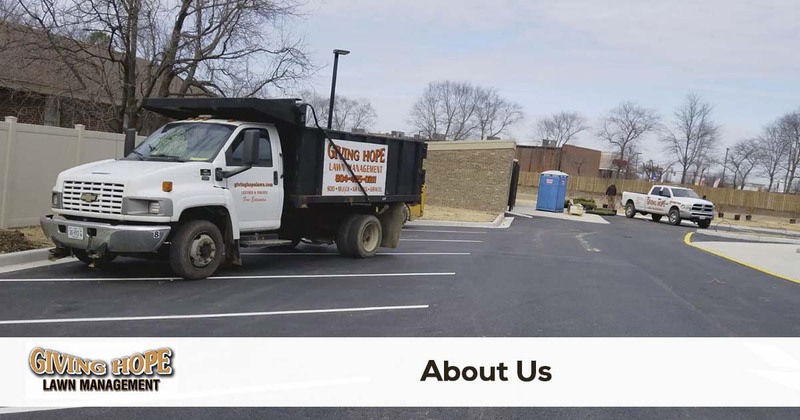 With years of experience providing services such as sprinkler installation, residential and commercial lawn maintenance, landscaping installations, and mulch delivery as well as install. We are confident we are your best choice for excellent customer satisfaction. But don’t just take our word for it. See what our customers have to say by reading their testimonials. No matter what your lawn management needs may be, we are confident we will provide you with excellent service, professional results, and satisfaction guaranteed. Give us a call: 804-405-0211, or contact us today to see how we can help you. If you are ready to get started with professional lawn care and landscaping services from Giving Hope Lawn Management, all you need to do is request a quote online or give us a call. We look forward to hearing from you.